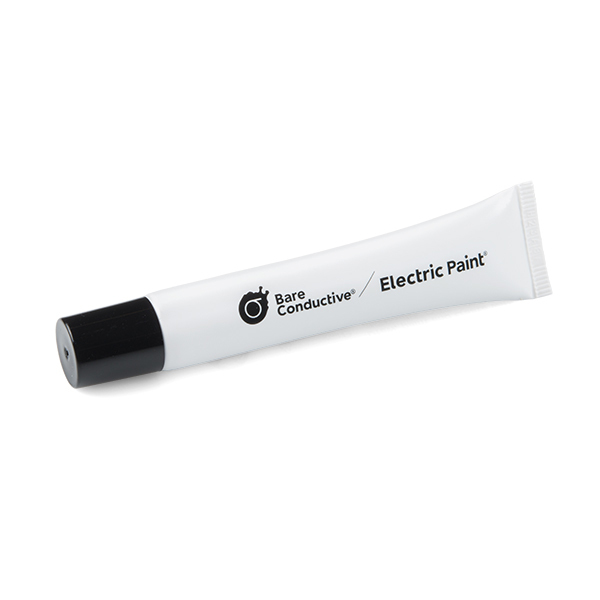 Bare Conductive's Electric Paint is just like any other water-based paint... except that it's electrically conductive! This means that you can actually paint wires onto things like models, clothes, furniture, walls, almost anything you can think of. Standard acrylic or water-based paints can even be used alongside Electric Paint to act as insulation or to create multi-layer circuitry! Oh yeah, and now? It comes in a pen! Bare's Electric Paint Pens are a great electronics prototyping tool for makers of all ages. Nontoxic and water-soluble, they can be used without gloves or mask. Once applied the paint dries quickly at room temperature, and can be removed with soap and water. The paint in the pens can take anywhere from 5-20 minutes to dry on paper, depending on relative humidity. Well I just bought a tube of this and wrote the words " LANOLIN GREASE " A multimeter placed across any part of it reads a resistance of hundreds and millions of Ohms. None of it is conductive and that after shaking it ,standing it on end etc for 3 days ?? It seems to stay softish too. Not at all what the description says? does say you can paint over it. You could use this to make a touch screen! It would be challenging to make a fairly linear one. Make a very even rectangular patch of this stuff with wires connected to all four sides. Apply voltage from left to right and measure voltage with a conductive stylus (this would be your X-position ratio). Then switch to applying a voltage from bottom to top and read the Y-position. Not terribly useful, but fun!